Please arrive about 5-10 minutes ahead of the scheduled class time so that class may begin on time. All classes will be held outside on a grassy area. In the event of rain, we do have an indoor area, so no worries. You will be checked in by your name as registered online – no tickets or paperwork needed. No refunds, but you can transfer/sell your ticket – just drop us a quick line to let us know the name of the person coming in your place. Solo attendance is welcome! You will meet others and have a fun experience! The yoga classes are designed for all levels of abilities. No experience necessary. We supply the yoga mats. 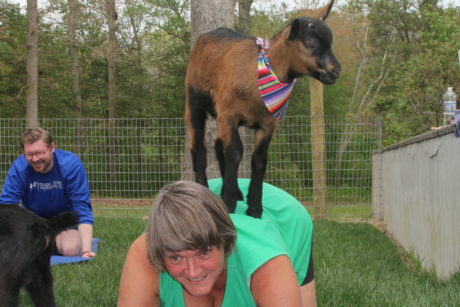 Wear older clothes, the goats most likely will climb on you. A T-shirt or something that fully covers your back and shoulders is strongly suggested. Save the open backs and strappy shirts for another time. Age: We use 10 as a guideline. Depends on the maturity of the child. 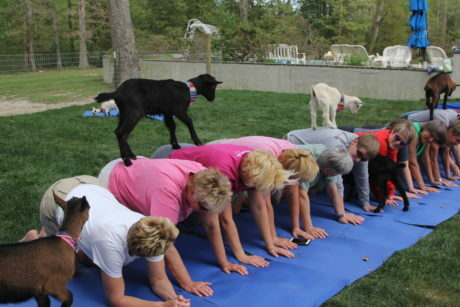 Must be able to follow along with the yoga class or sit quietly on the mat during class as the goats come to them. 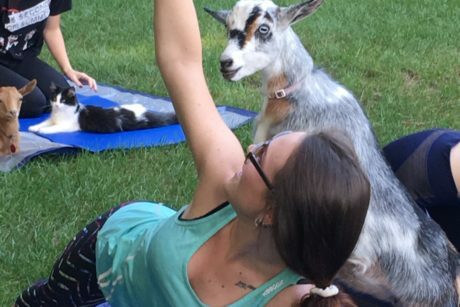 Absolutely no chasing the goats or disrupting the class. 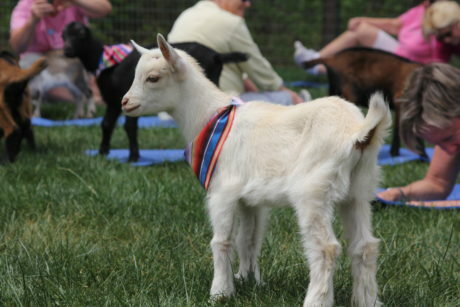 We have Goat Socials for ALL ages that may be more appropriate for some children and definitely for the younger ones. Goats also like to nibble. On everything, so limit things brought with you please. Hair in a ponytail or bun is a great idea too. Lots of opportunities for pictures. We will also take pictures during each session that you can download from our galleries. 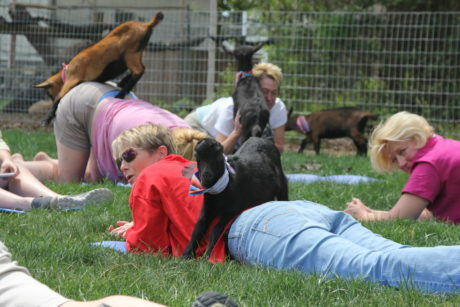 Time after class to enjoy the goats and ask any questions you may have about them. No picking up the goats until we have gone over proper handling. Please don’t chase the goats. Never turn a goat on it’s back. Hand sanitizer is offered for your convenience and hygiene. Please use it after class. Relax, enjoy, and have fun! May 3, 2019 - 4:00 pm$15.00 There are no tickets available at this time. May 4, 2019 - 12:00 pm$0.00 There are no tickets available at this time.